Andy Blair, un américain avec qui j’ai sympathisé sur Flickr. 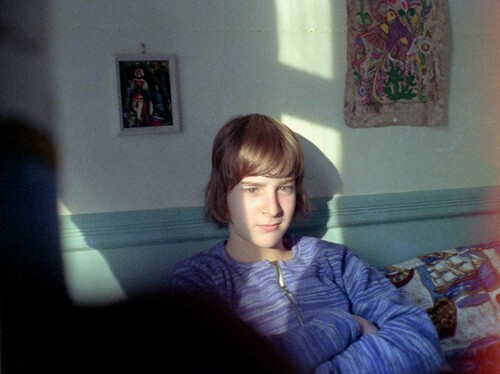 Il a prit des photos avec un instamatic alors qu’il était gamin et qu’il habitait le Connecticut au début des années 70. Je trouve ces photos vraiment bonnes, cadrages, angles de vue, lumières, couleurs ! Last day of school 7th grade taken thru an open school bus window. Freedom, Yahoo! June 1971. I just don’t know how this treehouse held up! Milford, Connecticut. July 1970. 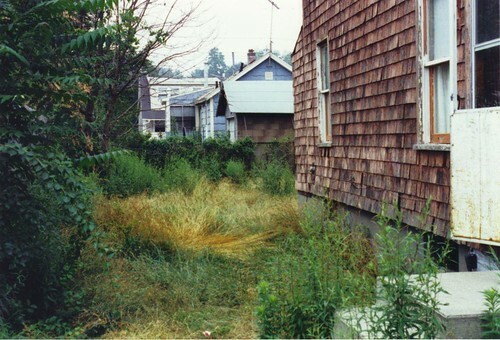 Our abandoned house and side yard two years after my parents sold the house. 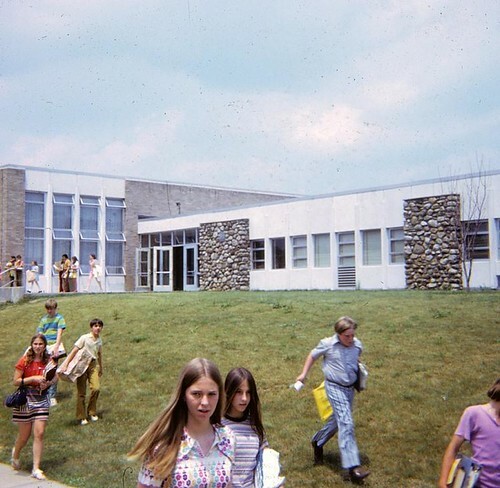 I grew up here in the 1960s and 1970s. Milford, Connecticut. 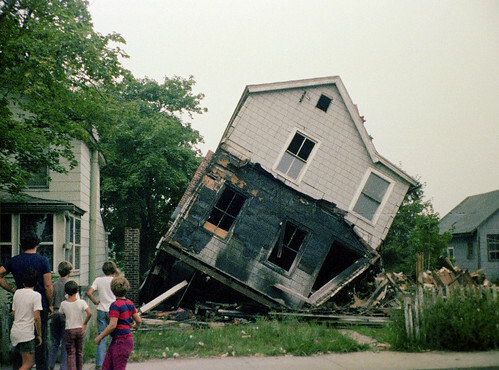 Aug. 1991. 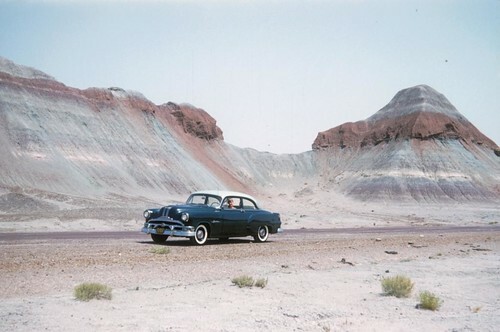 Mom and Dad in the middle of nowhere while driving the 1953 Pontiac Chieftan from New York to Los Angeles. 1956. Snow in our front yard with new Chevy Nova parked by the driveway. 1967. Our neighbor stuck in a Chevy Nova in the BIG 1968 Snowstorm. 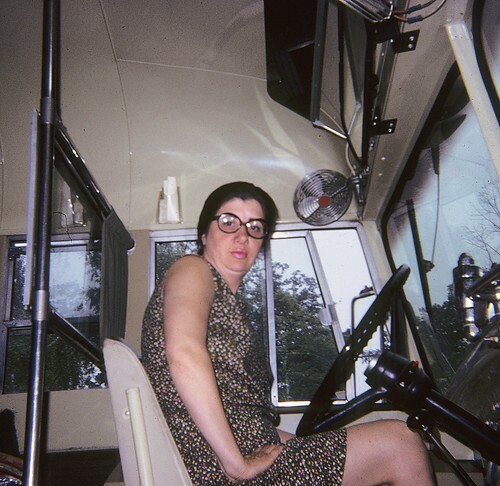 Elvie, the school bus driver for 7th grade. Milford Connecticut. 1971. 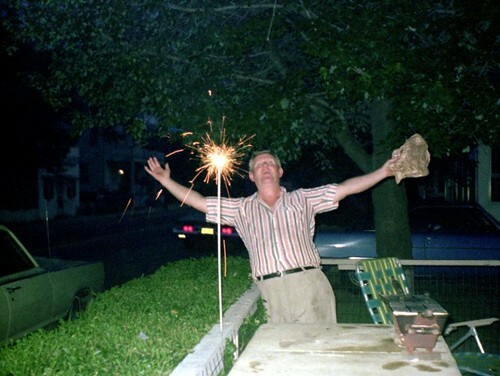 Our neighbor celebrating 4th of July in 1973. That is one LONG sparkler! At the corner of Rock St and Merwin Ave. Milford, Connecticut. I just couldn’t take enough shots of these 1900s beach cottages being torn down for new condos on Merwin Ave. Milford, Connecticut. August 1974. A friend from High School taken with what was then my brand new Kodak Pocket Instamatic 40 camera in October, 1973. 1970s car heaven! Ford Maverick, Chevy Vega, Oldsmobile, Mustang, AMC Javelin, even a red MG. (sorry, no Ford Pinto). From the top of the Temple Street Garage. New Haven Connecticut. Dec 28 1974. New scan of my favorite pizza place. Vinnies Apizza on Merwin Ave across from Sperry Street. (Shaeffer beer sign in the window). The abandoned 1920s Sauter Hotel on the other side of the beach entrance. Milford Connecticut. July 1973. Surf Club parking lot with an impending rain storm, my bike and a 1960s Ford. Milford Connecticut. Aug 1973. Scenic morning view from our porch of salt meadows and reeds years before hundreds of condos were built in the 1980s (on Sandpiper Crescent). Milford Connecticut. Aug 1965. Still life – couch with a stuffed toy bunny, stuffed toy dog and two cassette recorders. Milford Connecticut. July 1973. Never take a picture of two friends making out! Milford High School. Milford, Connecticut. 1975. The Variety Shop five and dime and its owner’s (Oscar) battered 1960s Chevy. Milford, Connecticut. July 1974. Subway 1973-style with graffitti. My sister is pointing to something between the cars. (perhaps a rat?) March 1973. New York. Dad and my sister on the 58th floor of the North Tower in the World Trade Center. April 1974. New York. 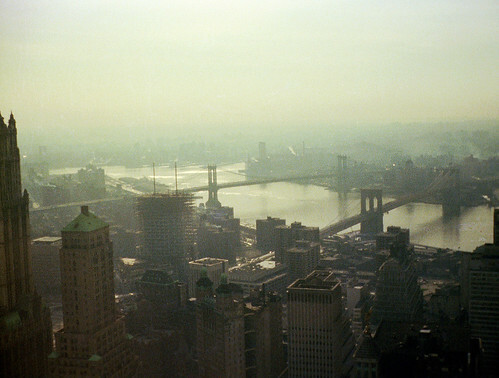 World Trade Center view of East River. 1975. New York. 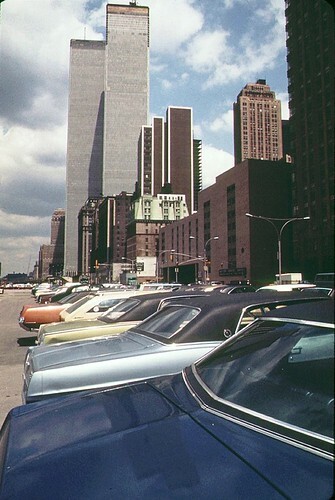 World Trade Center with lots of colorful 1970s cars by West Street. May 1973. New York. 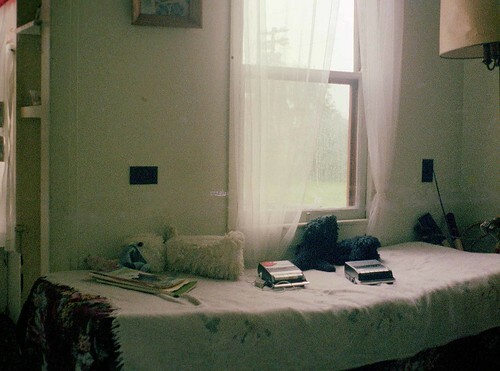 « The rectangular photos were taken with a Kodak Pocket Instamatic 40. The square ones were taken with a Kodak Instamatic X-15. 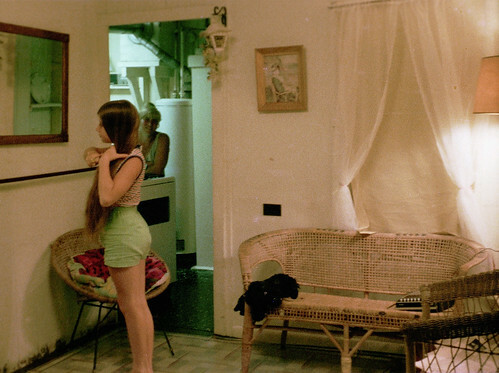 My father took the oldest ones with a 1950s Kodak Retina 35mm camera. Voilà… je crois qu’on a énormément appris ce soir, ensemble… à présent vous connaissez les photos d’Andy Blair, les format 110, 126, les instamatics. Voilà, quoi d’autre… sinon je suis hyper content d’être dans ce blog, je trouve que c’est un très bon moyen pour moi de diffuser des articles sur le web, en même temps ça vous permet aussi de lire mes articles sur internet et je trouve ça vachement bien pour vous.